Are The Credit Markets Seriously Underestimating The Dangers Of A Greek Funding Crisis? It’s time to start worrying that credit markets may be seriously underestimating the probability of losses arising from a Greek funding crisis. European credit markets have been way too subdued this week. It seems that the market is discounting the insistence from Germany’s Angela Merkel that there will not be an EU bailout of Greece. Why doesn’t the market find Merkel credible? Government officials who spoke to DealBreaker on the condition of anonymity said they are worried that the market is convinced the Federal Reserve won’t let a major US securities firm collapse. This is a cause for alarm because it indicates that investors are not taking into account full range of risks faced by investment banks, which could in turn remove an important market check on risky behaviour. Although Lehman and its rivals have been pushing down debt levels recently, cheap debt that is unlinked to institutional risk could encourage a new round of re-levering, one official warned. Ugh. It’s tough to read that in retrospect. We now know that Lehman did in fact decide that its access to cheap credit meant that it did not really need to delever, only to look like it was delvering. The markets simply failed to find this credible, expecting a bailout. Lots of smart money bets were made on the return to normalcy via a bailout of Lehman, which exasperated the pain of Lehman’s failure. The “lesson” of the government’s role in Bear Stearns’ collapse, in which equity got hit hard but bond holders were fine, created systemic risk. Similarly, betting on the effectiveness of governmental rescue plans for financial institutions was perhaps the most profitable trade of 2009. Although we only have anecdotal evidence, it seems that lots of hedge funds and trading desks at large financial firms are betting on the side of a European bailout of Greece. 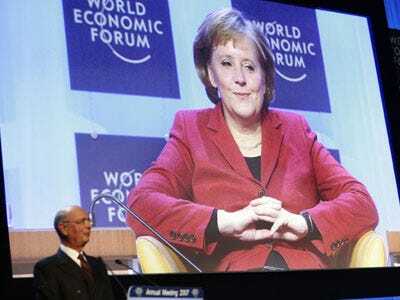 Are Merkel’s statements the equivalent to Hank Paulson’s bluff when his office leaked to the media that there would be “no government participation” in a bailout of Lehman (although had a buyer emerged the government would have helped). his situation is different because these are different sovereigns, so one cannot expect that it is a bluff. If it is a bluff, it is truly irresponsible. In addition, we know Paulson’s hand did not play out too well. Actually, Mike, it was not a bluff and Paulson’s hand played out perfectly. He did not bailout Lehman. Those betting on a bailout—assuming it was a bluff—saw enormous losses. Those whose investments are premised on a European bailout of Greece may be in for a similarly rude awakening.